Gauge Field Theories: An Introduction covers the basic notions and principles of gauge theories. This book is composed of 10 chapters that focus on the Salam-Weinberg model of electro-weak interactions of neutrino-lepton scattering, as well as the Parton model. 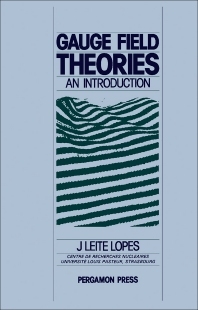 The first chapter is an introduction to solitons and instantons, as well as the topological quantum numbers, subjects that arose from the study of the non-linear field equations in gauge theories. The succeeding chapters deal with the concept of gravitational field, electrodynamical systems, the Yang-mills gauge fields, and the Higgs mechanism. The remaining chapters highlight the speculations on possible lepton and quark structured. These chapters present the SU(5) model of grand unification. This book will prove useful to physics university and advanced high school students.